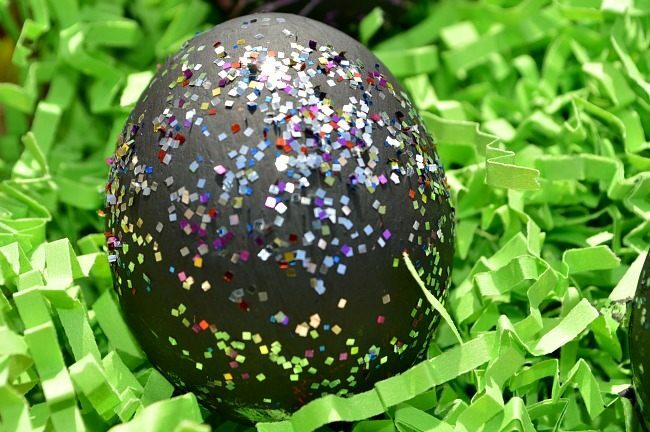 Have you started decorating your eggs already? Decorating appeals to many girls and mine are no exception. Nature girl she is, after collecting bugs and creating a terrarium, she had to decorate it with curtains! Yes, a soda bottle terrarium with pink sheers. Of course Easter egg decorations will positively excite her. 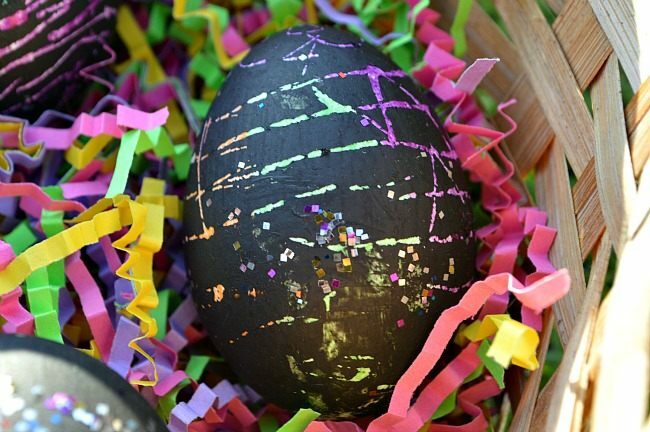 Today’s post is about decorating Easter eggs using the homemade scratch art technique. We started off with eggs at room temperature since eggs straight out of the refrigerator did will not take crayons well. 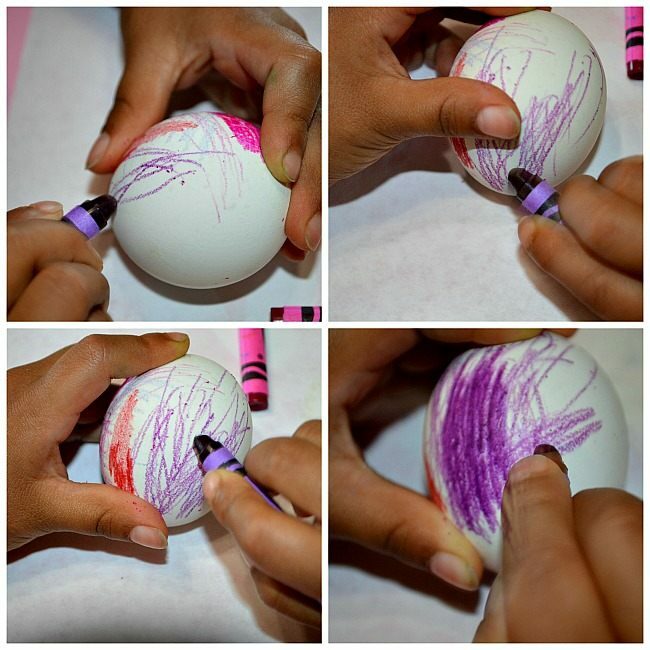 My preschooler started coloring the eggshell with some bright colored crayons. I reminded her to use multiple colors and to press lightly ( not too much- we are coloring on eggs) Once the child is done coloring the eggs, you might have to go over and cover up all the white with some color. 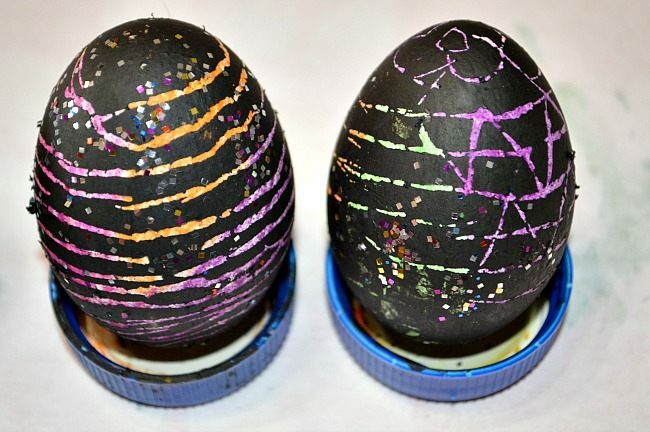 Make sure all the white is covered up with colors to have a fun looking scratch art eggs. Then she painted over with black acrylic paint mixed with a few drops of dish soap. Tempera paint will work as well. The black eggs by themselves look cool right? So much black screamed glitter and that’s exactly what we did. 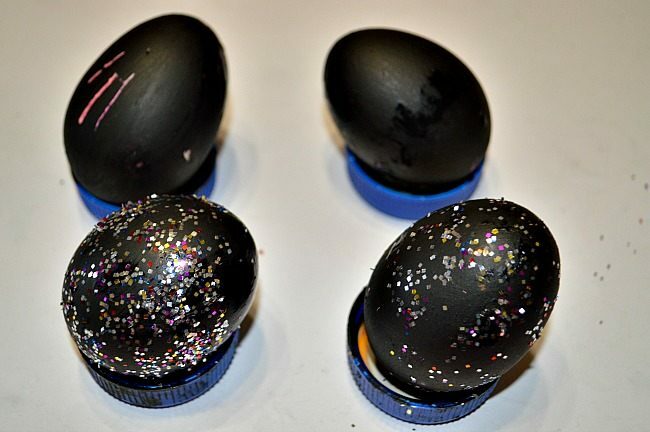 We drenched the black eggs with some glitter and let them dry. Drying time thankfully took around 10 minutes and we came back to scratch the eggs. Since this was the first time we are attempting homemade scratch art and the fact that we are working eggs, I had to put the camera down. My preschooler was interested in making lines and just about scratching. Also this is supposed to be ” do your own thing” kind of open ended art project ( our favorite kind) I tried not to give any pattern suggestions. She was very excited when her scratches revealed a bright array of colors. We went super over board with the glitter here. Don’t they look like space eggs? Very futuristic! 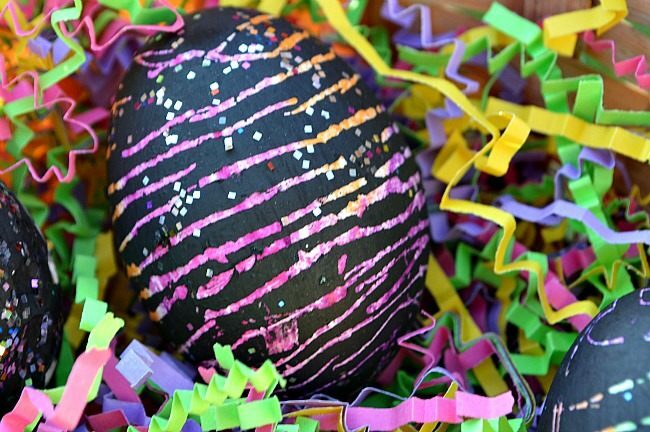 For more Easter ideas, visit our Easter Category Page. Thanks for stopping by our little space here. We encourage you to stick around and take a look at couple of our popular posts. Follow us on Pinterest for more kids activities. If you love play based learning and enjoy doing activities with your kids, Pinterest truly is the place to be: For parents, educators and care-givers. Hi friends, we are very glad to have contributed to a resourceful new e-book. Do you have toddlers or babies in your life and feel coming up with baby activities is so challenging? 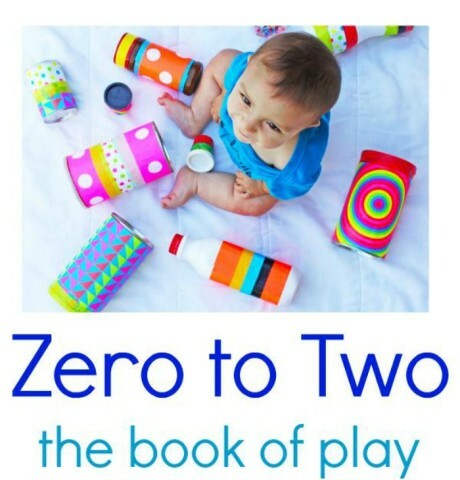 We, in collaboration with other bloggers have put together a book with GREAT activities for babies and toddlers. There are 25 unique baby/toddler play ideas. The activities for babies and toddlers are explained very thoroughly with bright pictures and clear step-by-step instructions. The ideas are very simple and perfect for busy new moms of babies and toddlers. You will get exposed to 25 new blogs where the women behind the blogs share so many ideas for baby play, toddler play, preschooler play and up. There are additional 50 links to whole new ideas for play. There is a wide range of activities with classic baby play, sensory play, homemade toys and many learning activities. Just found this through Pinterest, what a fun idea! What’s the ratio of paint to dish soap? You did mention a few drops of soap, how much paint? Thanks! 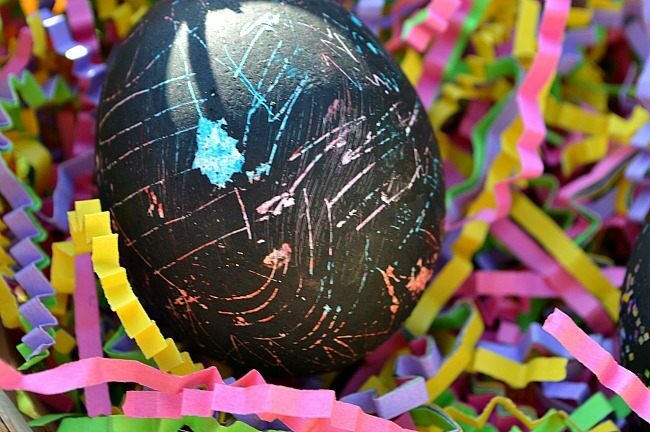 If you have other kid-friendly craft ideas, we’d love it if you would submit them. If you would like to display a featured button on your site, you can grab one from the right side bar of your post above. Thanks for a creative project idea! 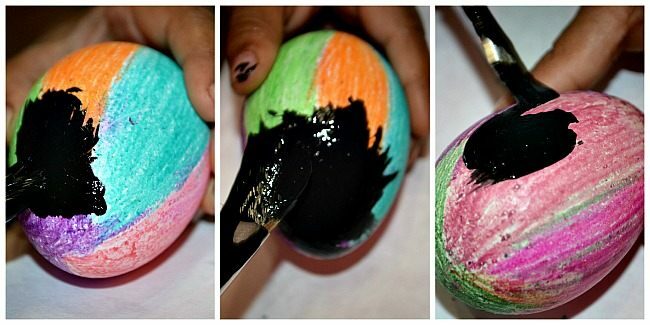 Can you dye the eggs first instead of doing the crayons? They look so great !! For sure that we will try them !!! Thanks for sharing them !! Can the eggs be hard-boiled? Sure. 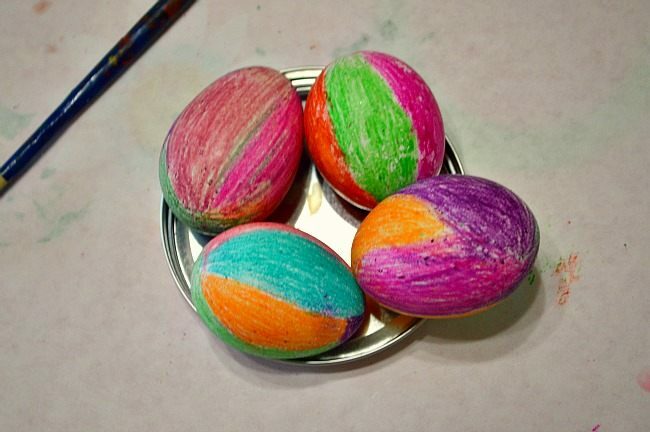 You can hard-boil the eggs first and once they reach room temperature use the crayons. Ofcourse you can’t keep the eggs for a long time. I just threw a couple of mine out. I was very interested when I saw post on a friends page. I’ve read how, & decided to share on mine & my children’s to do with their children…a family tradition! Thank you for sharing. Be blessed. Thank you. Hope you all have fun with this activity. What an original idea- these are brilliant! What did you use to scratch the eggs? 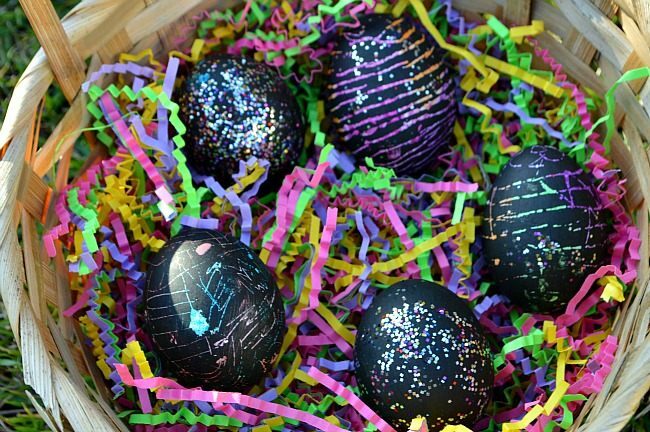 Hope you have fun with the scratch art on eggs. It was a cool activity.